Home LIFE & STYLE	New international flavours at Spud Shack Fry Co.
New international flavours at Spud Shack Fry Co. The Spud Shack Fry Co., located near the New Westminster campus at the SkyTrain station, is a place to go to hang out and have delicious poutine. 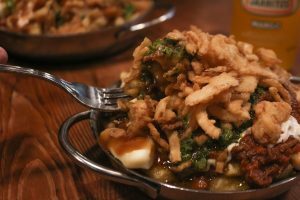 From time to time they introduce new flavours of poutine that are experimental and unique. Recently, they created two new flavours based on two different types of cuisine. These new flavours are combined with the usual fries, gravy, and cheese curds, but they also have a little something extra. First, we have The Gaucho “Cowboy”, which has Argentinian beef cooked in tomato sauce, charred onion, and roasted sweet peppers mixed with chimichurri sauce and roasted garlic mayo, then sprinkled with onion crisps. The mixed beef, chimichurri sauce, mayo, and gravy create a lot of different flavours. The beef is very juicy and the chimichurri sauce tastes like pesto. The onion crisps also make the poutine crunchier, which adds a nice texture to the overall dish. Their other new flavour is the PB&J. It might sound like a peanut butter and jelly sandwich, but it is actually inspired by Indonesian cuisine. It has satay mixed in a peanut sauce with blackberry jam, crushed peanuts, and cilantro put on top. The satay and the crushed peanuts combined give the dish a traditional Indonesian flavour. The jam is usually something that is not mixed with satay, but it adds sweetness to the poutine. You get salty and sweet! The new flavours that The Spud Shack offers are like whole meals in one poutine. They are definitely something that you could eat again and again.